Boxing fans will remember 2016 for a year of exciting fights, if not all of the ones we wanted to see. The two boxers that came out of 2015 with the biggest wins – Floyd Mayweather and Tyson Fury – did not fight in 2016 at all. Gennady Golovkin continued his devastating reign as middleweight king without fighting any of the division’s top names (at no fault of his own), whilst great champions like Manny Pacquaio and Roman Gonzalez continued to rule, if not in the same manner they once did. Andre Ward and Sergey Kovalev did clash in a true battle of modern greats, but who is the better of the two is even less settled than it was before they fought. All in all, although a lot happened in boxing in 2016, not a lot changed. With all of this in mind, most fight fans know what they want to see next year. They want to see the heavyweight kings clash. They want to find out who the best welterweight in the world is in the post-Mayweather era. And of course, they want to see Saul Alvarez vs. Gennady Golovkin. Yet, even with the New Year boxing wish-list set, every year there are always up-coming fighters to watch, those that are just a few fights away from joining the elite of the sport. So here are five boxers to watch in 2016. 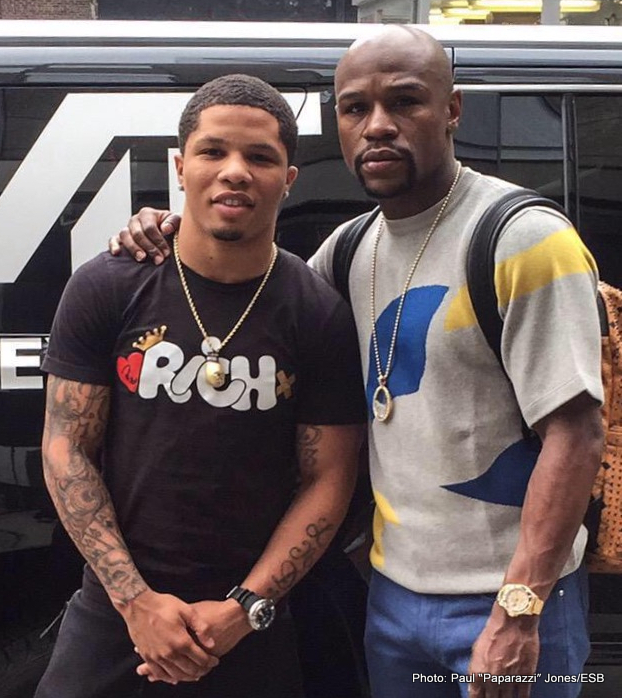 Arguably the most talented fighter under the Mayweather promotions banner, Gervonta Davis is a powerful featherweight nicknamed “Tank”, for the way he blasts through opponents. Perhaps unexpected for someone groomed by Mayweather, Davis is a come-forward fighter with an aggressive approach. The southpaw likes to close the range with jabs and straight-lefts to get on the inside, where he opens up like a mini-Mike Tyson, unleashing dangerous hooks and pulverising uppercuts. The comparison is not too far-fetched with one look at Davis’ knockout ratio and his highlight reel too. Because of the emphatic manner of his wins thus far, Davis has been accelerated to a title shot against Jose Pedraza, the skilled Mexican WBC champion in January 2017. A win for Davis would signal the breakout of boxing’s next potential superstar. However, even with a loss the Baltimore native will have gained great schooling in world title level, and the potential will remain. When writing these pieces, I never put two people from the same weight division, until now. And that is largely because the remarkable rise of Tevin Farmer simply cannot be ignored. Allegedly the nephew of the great Joe Gans, an all time great lightweight that reigned in the late 1800s/early 1900s, Farmer looks the epitome of a well-schooled boxer. His footwork, defensive posturing and athleticism are a sight to behold. He makes opponents miss in a fashion similar to Floyd Mayweather and does it whilst producing a high output of punches too. Yet this is a boxer who only won seven of his first 12 fights. Farmer puts this down to personal troubles during his formative years as a boxer, and also the fact he did not come into the pro-game with the benefit of a big promotional team, who often seek out the amateurs with extensive international pedigree. However, even with all that against him, the southpaw from Philadelphia is now on a 17 fight win streak. His eye pleasing – even if defensive – style coupled with his underdog story has made him not just a fan favourite but a real celebrity favourite too, with many other fighters and rappers often shouting him out on social media, posting videos of his matrix-esque reflexes on instagram. Farmer’s rise and popularity is surely to bring him a world title shot in 2017, with many calling for him to be put up against Vasyl Lomachenko in what would be a match-up of extreme boxing talent. Either way, 2017 is to hold big things for Tevin Farmer. Hughie Fury has quietly and even timidly made his way to world title level in the heavyweight division, in a manner of stark contrast in comparison to his (in)famous cousin Tyson. Fury is rated 3rd in WBO rankings, with David Haye at 2nd. With Haye likely to pursue a bigger named opponent instead of challenging champion Joseph Parker for the crown, Fury could get a title shot in 2017, and he could just win. Under the excellent tutelage of his father Peter – who did a great job in guiding Tyson to world level – Fury has developed into a classic boxer of a heavyweight, using his 6ft 6inch frame to utilise his range and pick opponents off. Thus far Fury has been brought through very well, taking on stern tests such as formerly undefeated Andriy Rudenko, the much avoided Fred Kassi and solid gatekeepers like Dominick Guinn and George Arias, all fights guaranteed to have helped him learn. A former World Junior Amateur Championship gold medallist, Fury has undoubted skill as a boxer, although he seems to lack power. However, he is young and has a lot further to develop, as his father openly admits. Yet, his father also states he is now ready for any heavyweight on earth, and Hughie Fury is a dangerous opponent for any of them. Why is a former two weight world champion that was just two years ago on every pound-for-pound list included in this list? Because not enough boxing fans realise just what Garcia can achieve in 2017. The former featherweight and super-featherweight champion showed just how good he was by stopping four former world champions in a row during a 12 month period from 2012/2013. At that point, Garcia was being seen as a future pound-for-pound number one. Then a contract dispute with Bob Arum’s promotional company Top Rank meant he did not fight for 30 months. During this period, many seem to have forgotten just how good Mikey Garcia is. In his first fight back last July he reminded everyone of his prowess, with a knockout win over Elio Rojas. A typical tough Mexican (fighting out of California), Mikey Garcia is the brother of Robert Garcia, a former champion himself and now one of the best trainers in the world. Mikey has clearly been taught well. He has a very fluid and intelligent style, showing great control of distance and a superb ability to setup shots. He is somewhere between a Juan Manuel Marquez and a Marco Antonio Barrera in terms of style, and has the ability to be remembered as great as the aforementioned Mexican legends. In 2017 Garcia first faces the very dangerous Dejan Zlaticanin in late January. Should he get past that, look for Garcia to rule the lightweight division and be marketed as a possible opponent for someone like Terence Crawford or Vasyl Lomachenko. The latest of the seemingly endless production line of top quality Eastern European fighters, Khytrov could be the heir apparent to Gennady Golovkin. Whilst there is some dispute from the media about how to spell his first name – Ievgen? Evhen? – there is no dispute about his talent. Khytrov won a gold at the 2011 World Amateur Championship. A year later he lost a controversial decision to Britain’s Anthony Ogogo at the 2012 London Olympics. A year later he turned pro, and has been steaming towards world level ever since. A typical Eastern European fighter, Khytrov has a systematic yet aggressive style, liking to constantly stay within range of opponents where he looks for gaps to land his dangerous straight-right and even more deadly left-hook. His style can often neglect his defence, with his posture often straight-up and his hands at chin level. However, thus far it has not really caused him any problems, largely because anyone coming close enough to engage meets with his ferocious power. Along with his power, Khytrov also has a real sense for the finish, becoming bloodthirsty and relentless when he has an opponent hurt. Khytrov is still working his way into world level but will make a giant leap into it with a win against undefeated American prospect Immanuwel Aleem, when the two meet in January. A win there will show that Khytrov is ready to move directly towards title level. The Ukrainian has already said he wants to fight Gennady Golovkin and should GGG win his fight against Daniel Jacobs in March, there won’t be many other names that the boxing world would rather see him fight.